John Anthony Burgess Wilson, FRSL (/ˈbɜːrdʒəs/; 25 Februar 1917 – 22 November 1993) – who published unner the pen name Anthony Burgess – wis an Inglis writer an componer. ↑ 2.0 2.1 2.2 Mitang, Herbert (26 November 1993). 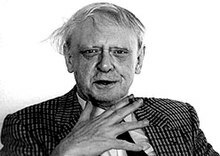 "Anthony Burgess, 76, Dies; Man of Letters and Music". New York Times. This page wis last eeditit on 26 Mairch 2018, at 20:23.